I’ve been writing monthly updates on industry e-book sales for a year now. 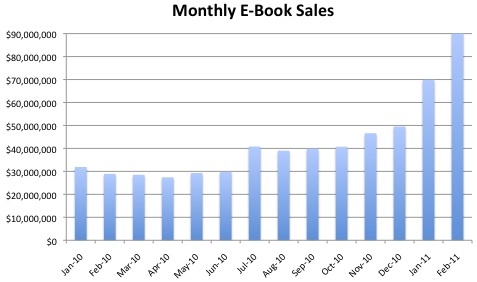 Recently, I predicted that January 2011 e-book sales would overtake mass-market paperbacks. They did. But even I didn’t see this coming. 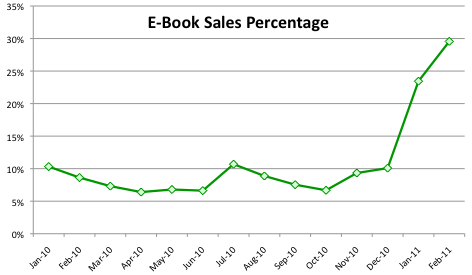 E-Book sales, which accounted for about 8.2% of trade book sales in 2010, hit nearly 30% in February. The trends are even worse for print, as e-book sales are up 202.3% (more than triple) from February of 2010, while adult trade categories are down a combined 34.4%. It’s hard not to be blown away by these numbers. I expected e-book sales to increase, and predicted a nice bump after the 2010 holiday season (when millions of readers unwrapped Kindles and Nooks and Kobos and Sonys under their trees), but e-book sales for February are over triple what they were just 8 months prior, and nearly double what they were just two months before! February 2011 sales exceeded the (at the time very strong) post-holiday sales of the entire first quarter (Jan, Feb, Mar) of 2010. Amazing.